This is pretty much what the start up screen looks like (I tinkered a bit with the defaults for the box borders and background color.) One thing I decided that immediately had to go was the little info map square at the top left of the work area; you can hide it by clicking on the slanty arrow right next to it. I like this program a lot as an on-screen editing environment. I also think it would perform well as a mind-mapper, a virtual storyboard for plotting, and a simple, first draft-type writing area. I would love to see it direct-to-print enabled -- why, yes, I am that lazy -- and I think it would also be cool if you could import actual images as well as text into the note boxes (if there is an option to do this, I didn't find it tonight. All I see is an export option that allows you to send a screenshot to the clipboard or as a .png) Looking at an image of someone or something while I'm simultaneously writing about them would help me with little details that I might not remember. So would having the ability to put floor plans, scene choreography maps or story palettes up on the screen next to a chapter I'm editing. What I really liked was how easy and logical Story Lite is to use from the first time you give it a go. The limited amount of tools and commands on the task bar were a big plus for me; I find I'm more apt to experiment and try using a new program if there aren't a bazillion menus, icons and options I have to first figure out. I also think it can be used for many other writing tasks, as you can pretty much tailor it to your individual needs. If any of the above sounds useful to you working writers, I highly recommend giving this freeware a try. I also think it's worth watching, as the designer is planning to develop it, and has created a community for registered users to provide feedback and exchange ideas. Mmmm. 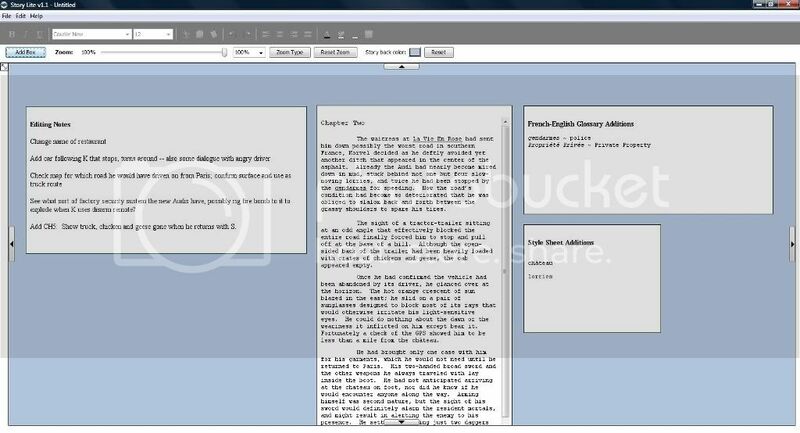 Sounds interesting, but I went and fell in love with Scrivener once the Windows version went Beta. I may try that one out just for the heck of it, but Scriv has made such a huge difference in my work habits that I'll probably stick with it. "I find I'm more apt to experiment and try using a new program if there aren't a bazillion menus, icons and options I have to first figure out." Thanks for sharing. This looks pretty kewl! I'm with you on the not over-complicated. It has to be easy to ramp up or my current system is automatically better. This looks interesting, and I am playing with different editing concepts, so I'll give it a look. * SPEED UP work with this multiple box text editor (images imported soon). So, no, it doesn't do it now, but should soon. I think I am going to give it try...We are a small team of people who write manuals and workbooks and this is a very efficient way for proofreading. Right now we use different colours but this looks like it`s much easier to manage. Is there a linux version yet??? I own Liquid Story Binder. I've tried using Scrivner for Windows and also yWriter (to a lesser degree, I'm still putzing with that one) and I think I've figured out that none of these are really for me because I just can't figure out how to use them efficiently enough. I'm such a pantser, anything that remotely resembles organization or plotting looks fun but never gets used. Maybe if I did, I'd be more successful. Who knows? Thank you for the heads-up on the program. Going to try this out now! 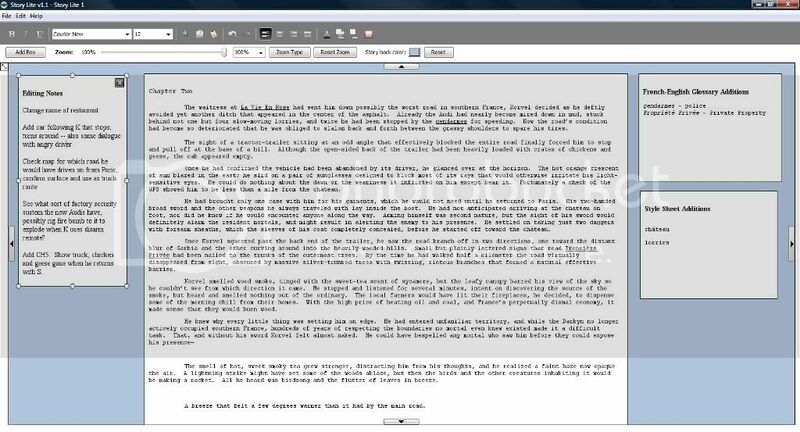 And I didn't know Scrivener has a version for Windows! OMG. Always wanted to try that but as a non-Mac person, I just couldn't ever do so. Just downloaded it. And I have to say..it's pretty sweet. Am also glad that there're not many bells and whistles. 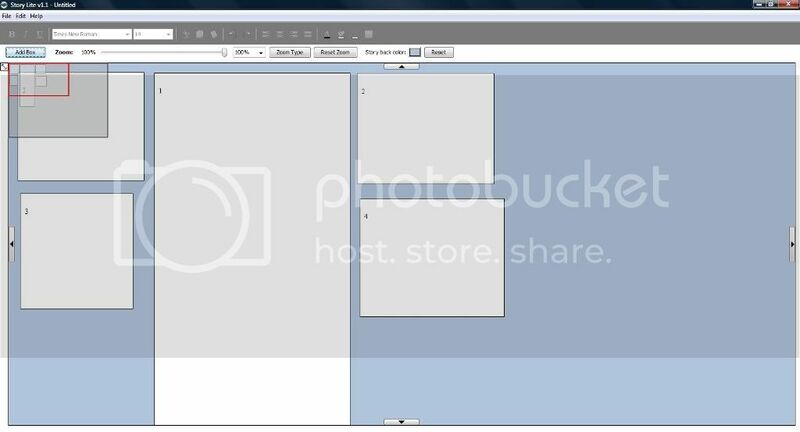 Would like to be able to import images into it. Just downloaded this a few days back and I am enjoying putting it to use with my own writing and organization. My only issue is that when you copy and paste into Story Lite it drops letters. Anything after a ' or "
Has anyone else encountered this issue, and if so, how on Earth do you fix it? Or stop it from happening?